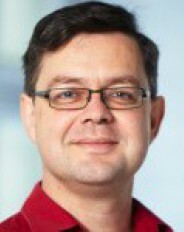 Matthias Troyer has been full Professor for Computational Physics at the Institute for Theoretical Physics at ETH Zurich since 1 July 2005. Within MARVEL phase I, he was the project leader of Vertical Project 1. Prof. Troyer was born on April 18th, 1968 in Linz Austria. He studied physics for two years at the university of Linz and then moved to ETH Zurich where he graduated. He received his Ph. D. in theoretical physics in 1994, under the direction of D. Würtz (Interdisciplinary Project Center for Supercomputing, ETH Zurich) and of T. M. Rice (Theoretical Physics, ETH Zurich) for the numerical simulation of fermions in low dimensional systems. After staying in Zurich for another year as PostDoc he moved to the University of Tokyo, where he spent three years as a fellow of the Japanese Society for the Promotion of Sciences at the Institute for Solid State Physics. In 1998 he returned to ETH Zurich as senior assistant to continue his research and to develop and teach a series of courses in computational physics for students of "Computational Science and Engineering". In spring of 2000 he was awarded an assistant professorship of the Swiss National Science Foundation, in June 2002, he became Associate Professor at the ETH Zurich. His main research fields are the development of simulation algorithms for quantum many body systems, the investigation of quantum phase transitions, strongly correlated materials, ultracold aromic gases, and quantum devices. Visit his webpage at the Institute for Theoretical Physics, at ETHZ.